According to their website, “The Student Union Building is the core around which student life revolves – establishing the UBC student body as a community and providing the functions that server and define the community.” Henriquez Partners Architects / IBI Group is a partnership between Henriquez Partners Architects and IBI Group. 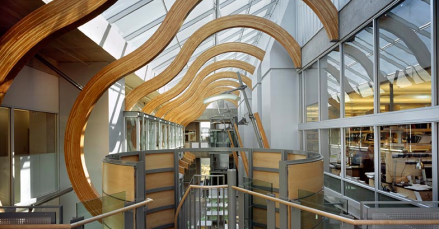 Together, they have built the Michael Smith Laboratories at UBC. HPA+IBI seem to be seriously lacking on the social media front. Please correct me if I’m wrong, but I can’t seem to find a facebook group or a twitter account for this partnership. This concerns me mainly because facebook and twitter will definitely be the most economical way to reach out and communicate with students. The presentation was centered around the work this partnership did on the Woodward buildings. They showed all the amazing things that they did with this building as well as all the things that needed to be done to manage all the different demands of its future residents. This showed off their capacity to deal with complicated (something that will be necessary on this project), something that is definitely appreciated. This partnership has done over 40 projects over 20 years that have all be on or below budget. HPA+IBI are very keen on participatory design and sustainability, focusing on more than just environmental sustainability (cultural was mentioned). They believe that community engagement is one of the most important parts of a project, something that I whole heartedly agree with. Besides the standard consultation methods, I don’t think this team brought anything that was out of the ordinary or outside the box. The team seems to be geared towards smart building technology. Their specialization was the ability to manage buildings and resources more efficiently. They also seemed to be into the idea of listening to the students and not approaching our project with any preordained design or a design rational. They feel that it is their job to work for more people rather than fewer people. This will definitely come in handy come design period when students are giving their input. They took the example of the woodward project and discussed all the different problems and what their solution and how they came about their solutions. While it was easy for me to make the connections between our project and the Woodward project, I think this presentation could have made the links much more clearer. I would like to have heard more explicitly how they would have applied their skills set to our project. I know that this team has had some experience on campus, I think they should have highlighted it more. I loved that they went into depth about a project they just completed. It really showed their capacity to deal with user input, something that will be so important with our students. Their answer to an audience question about life cycle costing really impressed me. I don’t recall the exact question, but their answer was that they want to build a building that inspires people. If the users feel passionate about a building, it means that the users won’t want to tea it down, they’ll find some way to reuse it. I’m a big fan of this answer because if the AMS wants a building that will stand the test of time, then it absolutely needs to be something the students are passionate about!